The native camas (Camassia quamash) flower is beginning to emerge in the Arboretum, although it is not yet blooming. However, the leaves from some surplus bulbs that we planted in a garden plot in the arboretum last fall are growing vigorously already and it might not be that long until we see the central flowering stem begin to emerge. I haven’t been able to see yet whether a small patch of a few hundred bulbs that students planted on the edge of a wet meadow in fall, 2009, have survived some construction and landscape contouring in the arboretum. But I think they might have missed the bulldozer’s blade and we will know within a few weeks. 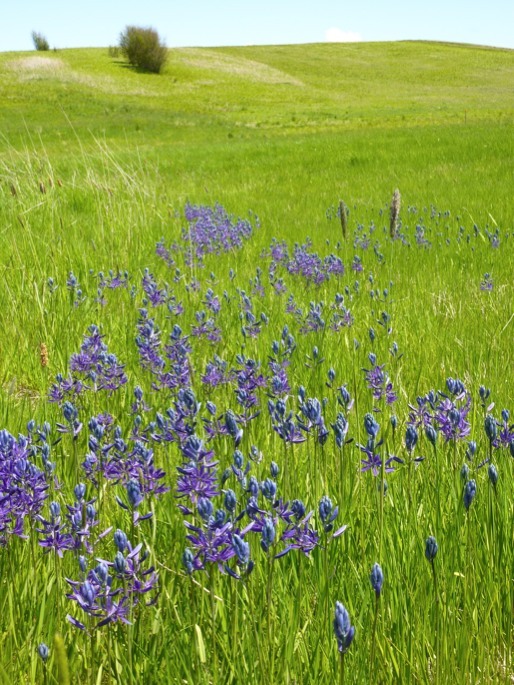 The story of camas bulbs and their beautiful blue flowers that once covered vast wet meadows of Palouse Prairie like blue lakes is an interesting one. It’s a story that we will undoubtedly cover in depth here at Nature @ WSU. For now, however, I just want to show you some photos of the growth of camas in the WSU Arboretum as we welcome the signs of early spring. The photos above and below are from the flowering camas plants last year. They show what we might have to look forward to in the next few weeks of spring and early summer. So let’s begin with a few photos showing you what the flowering camas looked like last spring after WSU students in our course in Restoration Ecology planted the bulbs the previous fall. I’ll then return here and update photos periodically so that you can track the progress of the flowering bulbs this year. The small patch of blue camas looked beautiful last year and certainly gave me pause to imagine what an entire large wet meadow landscape would look like covered with these flowers. Stayed tuned for photo updates. We’re hoping, and thinking, that most of this flower patch made it through the construction of the Gathering Circle. If not, we’ll definitely replant some more bulbs this coming fall. 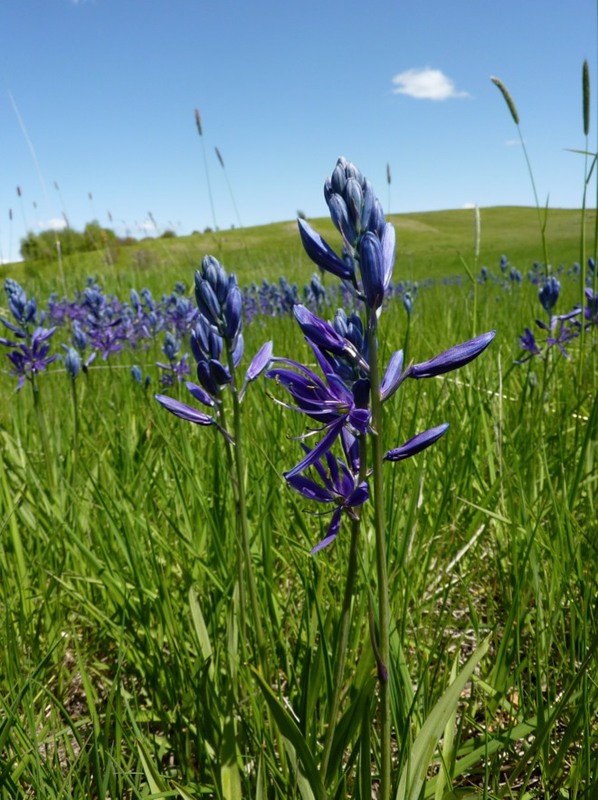 We want to make sure that we have the native camas growing in the new WSU Arboretum & Wildlife Conservation Center at Washington State University. Nice pictures and article. I am looking foward to seeing this beautiful native plant flower bloom. I have some in my home garden and they are an excellent addition for spring color; easy to grow and multipy fast… but nothing beats viewing them in their native habitat. How true. My wife and I have some camas in our home garden too and we enjoy them every year. And I’ve noticed bees certainly like them! But when you see an entire wet meadow covered with these flowers, it is stunning and always makes me wonder what Palouse Prairie in spring looked like to the early settlers. I also have native camas planted around my small farm. I am cowlitz indian and my tribe and others of the pacific northwest used to rely on the camas as part of our diet. That is one reason I am growing them. The root is edible and I’ve been told that it has insulin type properties, hence diabetes was never and issue in the past.